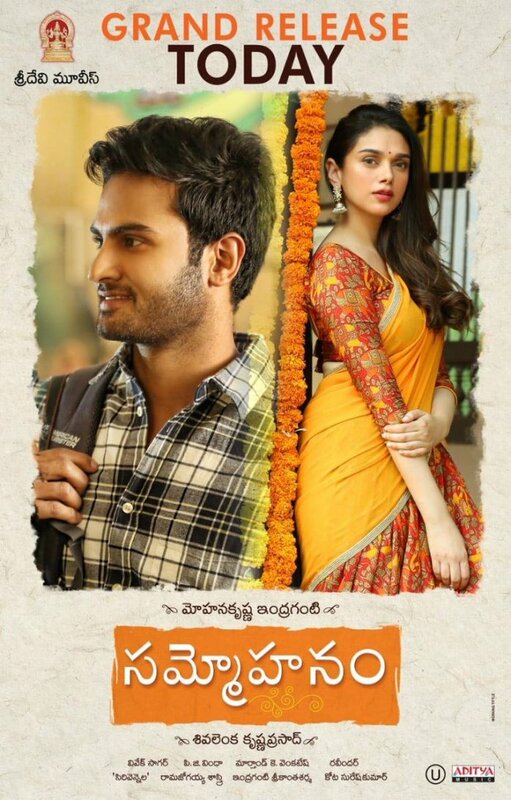 `Sammohanam` is a Watchable Romantic Drama. Ajay (Sudheer) is an artist with traditional values and Sameera (Aditi Rao) is an Happening Actress. Her film unit seeks Ajay`s house for a Few weeks Shoot and their family agrees readily. Sameera asks Ajay`s help with her Telugu lines and eventually they fall in love but she remains tight-lipped. Will Ajay win her over?. Sudheer Babu is cool and is at ease with his Character. Aditi Rao handles her parts gracefully and fits the bill perfectly. Senior Actor Naresh shines in an Entertaining role and Pavitra Lokesh is good. Tanikella Bharani, Kadambari Kiran, Nandu, Rahul Ramakrishna, Hariteja and others are adequate. Sammohanam takes its own time to establish characters with lengthy conversations. The 1st Half of the film deals with Romantic Episodes and its 2nd half tracks the misunderstandings and the eventual patch-up. Chemistry between the lead pair and Entertaining episodes make this a worth-ful watch despite its share of flaws. This would probably be more appealing for class audiences. Box-office Verdict : With Worldwide Theatricals value at 8 Cr, this should be at-least an average earner. Punchline : Bujji and his star!.